This week Monkey boy was off to Chinese camp. He was invited to try out the week long Mandarin Media Moguls program for P1 to P3 students at Chengzhu Mandarin Centre (Julia Gabriel Education). This program is one of the program offered specially for the week of 4th to 8th June as part of their Mandarin holiday programmes. This program was carried out 3 yrs ago and recently revised and re-launched this holiday. The students in the class were given a script and made to dub the dialogue and become the leading characters of the cartoon, following the exploits of a fairytale mole. Students learn how to express themselves in Mandarin with colour and creativity as they work individually and in themes during the drama activities and literacy games sessions. The program aims to enhance the child’s listening and oral skills and building up their confidence to read and write Chinese in the process. Housed at Rochester Mall there are several classrooms where lessons are carried out. 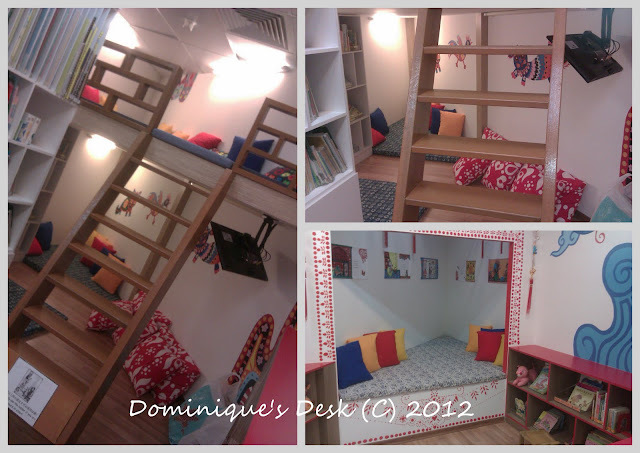 There is also a library where students can borrow Mandarin storybook to read or huddle up at one of the cozy corners within the library to read their selected books. 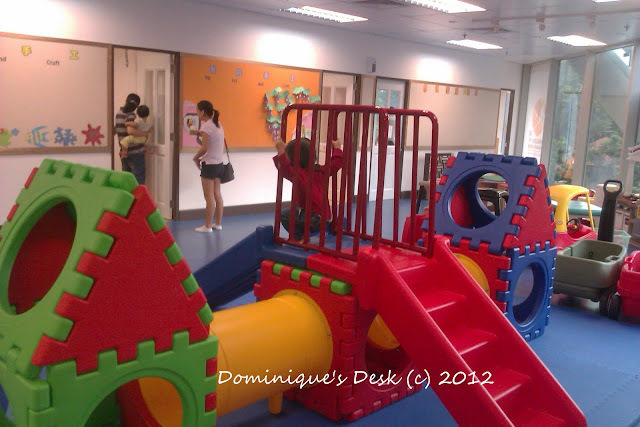 There is a small playground outside the classroom which Monkey boy was in. It was an attraction for Tiger girl as she waited for her brother to finish the class when we were there to fetch him after the 2.5hr session was over. Monkey boy was really interested in attending the camp as he has always loved drama and acting. This Media Moguls program seems to be an excellent fit for him this June holiday. I personally got a chance to experience the programme when I sat in during the lesson on during the week. The teacher acting as a tourist visiting the Night safari. The students were play the role of the mole, lions, pelican , elephant, rabbit and dog. This was a warm up activity to get the students into character. While one of the teachers was playing the role of the tourist the other teacher present drummed up the mood by playing relevant music on the keyboard. At the end of the activity the teacher used a clapping ditty to get the attention of all the students as some of them were rather distracted and started talking among themselves. The short 10 min warm up activity was followed by the teacher giving a recap of the story line which the students had been working on. After a session of play acting as animals the students were lead a breathing exercise to exercise their mouths and strengthen their diaphragms. This was in anticipation of them doing the voice over for the characters in the cartoon. They were taught the different expressions which they could use to express delight, dislike, surprise and curiosity when given an imaginary sweet by the teacher. The main activity was getting each student to speak the dialogues based on the character they were portraying in the cartoon. Each child was given the script and was expected to say their part when they see their character appear on the screen. A student saying her lines into the microphone which is being held by the teacher as the cartoon is being shown on the screen. Once the students have run through the whole script as least twice the teacher took the first group of students into the recording studio to video them introducing themselves and the character which they will be portraying. Monkey boy saying his piece through the microphone. He was acting as the tortoise in the script. He was very confident and was able to say his piece in one take. I was very impressed. 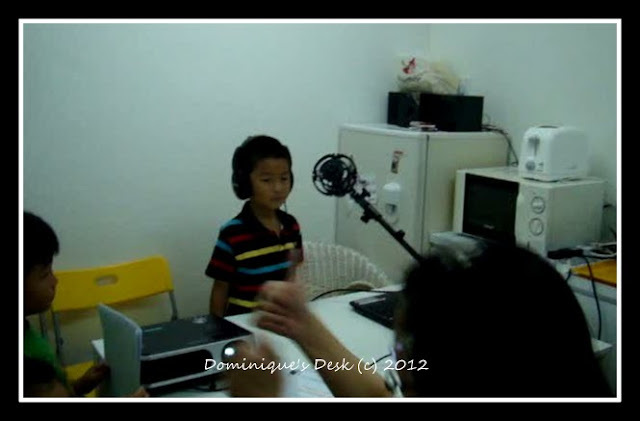 The students were having an open session on Friday and all parents were invited to view them doing their voice overs. They were doing up a post with their names and characters which they were acting as to be pasted outside their classroom as the last activity for that day. I found that the teachers were able to fully capture the students attention and skillful in leading them through the various activities that have been planned for the day. Having two teachers in the room also allowed for more flexibility when the group had to be broken up into smaller groups or when they were doing differentiated activities. Time management and the movement from one activity to another was also well coordinated with the students being fully engaged in the learning process. The teachers were very encouraging and constantly gave praises to the kids to encourage them. Monkey boy truly enjoyed his time attending this Mandarin Media Mogul program and it was a great experience for him. I certainly recommend this program to parents who would like to immerse their child in a fun Chinese environment during the school holidays. To find out more about the other holidays programs or to get information about their next holiday programs you can visit their centre or call them up. Disclaimer: Monkey Boy was sponsored a place in the Mandarin Media Moguls program. All opinions expressed are 100% my own. Nice! It looks like a well thought out and executed program. The children look very engaged too. For the last photo above, was it more of a word recognition / reading / matching exercise? The last activity involved the students filling up their names on the poster according to the characters they were potraying. They were also involved in the decorating of the post. It’s not a word recognition/reading/matching exercise. this is interesting. hehe thanks for the information! I like the ingenious way of teaching. Will keep this in mind for when Poppy is older! That’s the way to get kids interested! Great pic of Monkey Boy!